Reducing waste is not a new idea for our community. Over the years, various efforts helped catalyze Missoula's formal commitment to moving toward zero waste, via the ZERO by FIFTY policy process and final plan. The ZERO by FIFTY resolution was adopted by City Council in 2016, and after community input and lots of hard work, the ZERO by FIFTY final plan was adopted unanimously in August 2018! 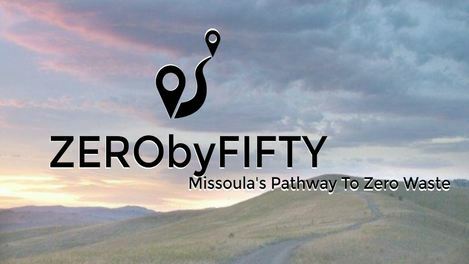 Check out our community's newest resource, the ZERO by FIFTY Missoula website, for all the info on what's in the plan, what's happening now, and where we're headed. A report by Eco Solutions was recently published detailing our community's bold efforts to achieve zero waste. This report highlights Missoula's exciting ZERO by FIFTY plan. Missoula has a major need to improve its waste system – we recover only 20 percent of our total waste. A grassroots coalition called Zero Waste Missoula generated momentum for the Mayors declaration of Moving Missoula to Zero Waste Month. Grassroots mobilization can achieve institutional change! Zero Waste Missoula drafted a Zero Waste resolution that was adopted by the council in February 2016. The policy commits the City to creating a Zero Waste plan to achieve 90% waste reduction by 2050, with interim goals of 30% by 2025 and 60% by 2040. To draft the plan, City staff and a community nonprofit partner Home ReSource formed the ZERO by FIFTY leadership team. Interested in learning more about the ZERO by FIFTY process? Check out the full report here.